The PASTD TG is one of the longest standing CODATA Task Groups. On 9th November 2016, CODATA PASTD held working meeting to discuss the preparation of International workshop and training course in Madagascar in 2017 at St.Peterburg during the GEO week. PASTD Task group member and international colleagues from GEO, WFEO, WDS, ISDE, UN GGIM, Ministry of Environment, Forestry and Tourism, Madagascar attended the meetingand CODATA treasurer John John Broome and TG Principle Liaison Alena Rybkina attended the discussion. To speed up the activitites coordination, the organizing comittee was established after discussion. The theme for upcoming workshop will focus on Open Data in developing countries for SDGs in a Big Data World. The organizing comittee will work together in the following month to acceralate the preparation of workshop in Madagascar. In SciDataCon2016 during the international data week in Denver, the PASTD task group organized Panel Discussion Session to discuss key Issues and action plan for the preservation and access of research data in developing countries. The group was held at the afternoon on 13, September and chaired by the Dr. Xiang Zhou, the co-chair of PASTD task group. Dr. Zhou made welcome speech and gave a brief introduction about the CODATA-PASTD task group and Practices of Preservation and Access of Research Data in Developing Countries. The session provided a forum for participants from multi-disciplinary to exchange ideas about key Issues on data preservation, access and sharing of research data in developing countries. As the Co-organizer, the CODATA PASTD will jointly with UN GGIM (The United Nations Committee of Experts on Global Geospatial Information Management), National Geomatics Center of China to have the training workshop on Global Land Data Validation from 18-19 April 2016 at UNECA's Headquarters in Adis Ababa, Ethiopia. Prof. LIU Chuang, Secretary of CODATA PASTD will have a lecture on Cases and Best Practices of Global Land Validation in the Geo-eco-region of Roof of the World. The training workshop is linked to the UN-GGIM High Lever Forum on UN Global Geospatial Information Management at UNECAS's from 20-22 April 2016. 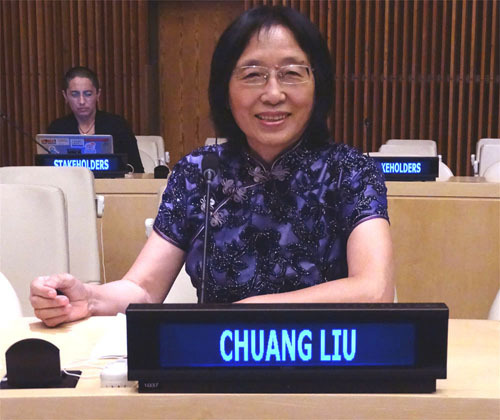 Professor Liu Chuang, CODATA PASTD Task Group Secretary, addressed the United Nations General Assembly's interactive stakeholder consultation for the 10 year review of the World Summit on Information Societies (WSIS+10), on the 2d July 2015: "Enhancing Joint Efforts on Data Sharing in Developing Countries". To get expanded information about this event, please see our post " CODATA and WSIS+10 at the UN General Assembly" here. The speech is available on the CODATA Zenodo page and on the Global Change Research Data Publishing and Repository website. Data Sharing Principles in Developing Countries (The Nairobi Data Sharing Principles) were endorsed at the International Workshop on Data for Sciences and Sustainable Development which was held from 6-8 August 2014 at UNESCO in Nairobi, Kenya. Worldwide leaderships on data participated the workshop. The participants included representatives of CODATA, WFEO, UNESCO, the Ministry of Information and Telecommunication of Kenya, Jomo Kenyatta University of Agriculture and Technology, Kenya (JKUAT), ICSU, RDA, WDS, ISPRS, ICA, ISDE, CODATA-China and CODATA-USA. See the declaration of principles on the CODATA Zenodo page and the PASTD TG website. The training workshop on Open Data in Developing Countries was held in Jomo Kenyatta University of Agriculture and Technology, Kenya from 4-5 August 2014. Nine international experts from Japan, USA, France, China and more than 60 scholars from African participated the workshop. CODATA PASTD cooperated with CODATA Germany and several other partners to organise the International Interdisciplinary CODATA Conference on Environmental Information and Communication: achieving sustainability goals through knowledge sharing, 6-8 February 2013, in Bogotà, Colombia. More than 50 participate from Latin American and the regions attended the meeting. Information about the event and the conference proceedings are available from the conference website. Based on the CODATA 'Hand in Hand' (partnership) strategy, the Letter of Interest on Digital LIN Chao Geomuseum was signed by Presidents of International Geographical Union (Ronald Abler), CODATA (Huadong Guo) and Geographical Society of China (Yanhua Liu) in October 2011. The Digital LIN Chao Geomuseum was initially developed in Chinese and an English version of the museum is on the way. More than two hundred contributors world-wide have donated to the museum. Several 'halls' of exhibits have been established, including the International Scientific Cooperation Program Halls covering the first International Polar Year and the second International Polar Year. Halls for the International Geophysical Year and the fourth International Polar Year are in preparation. The Satellites Hall covers 1957-1959. Images of more than 40,000 post stamps from over than a hundred countries covering more than one hundred of yeas are presented.